Ayr gets a mention in the famous Robbie Burns poem Tam O’Shanter and is described as ‘Auld Ayr, wham ne’er a town surpasses for honest men and bonie lasses.’ Quite a flattering description really. This weekend found me staying with a friend above the Robbie’s Drams whisky shop on the Sandgate, the main road through the western coastal town and deep in Robbie Burns country. Apparently the council are considering renaming the airport Robbie Burns airport rather than Prestwick airport as it is currently known. Sounds like a plan to me, I don’t know why they’re waiting! 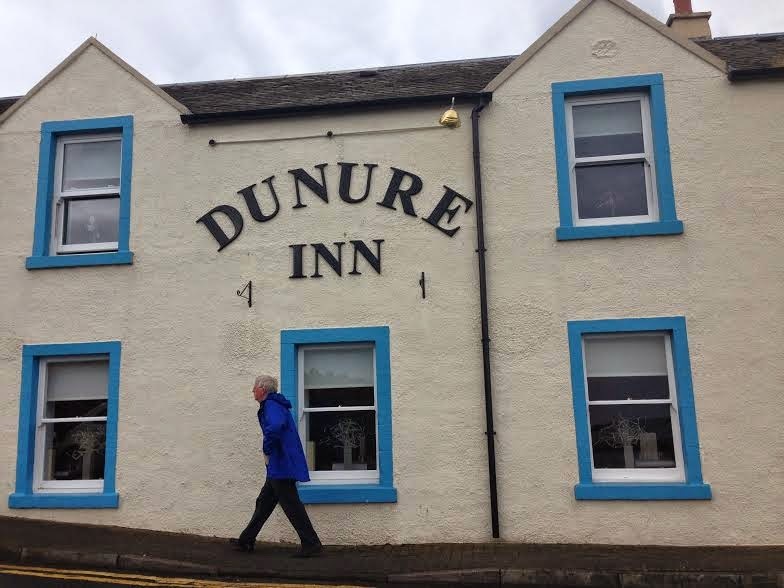 I’ve never been to this part of the world before and there was certainly plenty for us to do, exploring all things Scottish in and around the town. I do like the way some places paint their buildings different colours – why can’t we do more of it I’ve often thought? I would make our grey bricks and concrete towns and cities so much jollier. 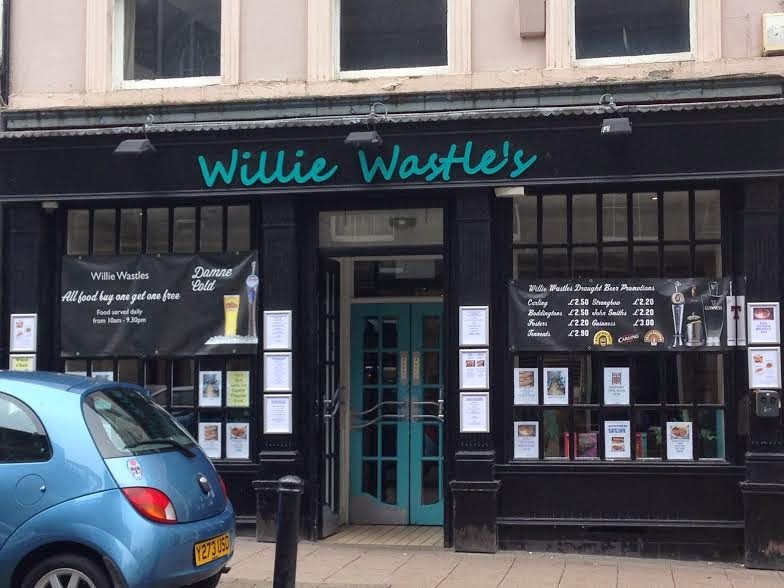 Ayr high street has some great pubs to be sampled. You can wet your Whistle at Willy Wastle’s, or bevy a bottle at Billy Bridges. Jim the bar man at the rather bijoux establishment of Billy Bridges has worked there for forty years and was looking forward to retirement in just six years time! This part of the country is also well known for its seafood and we had a lovely meal in the Tree House restaurant one evening on Ayr High Street a bustling and popular restaurant.The next day I sampled seafood linguine with white wine at the Dunure Inn in Dunure harbour – the trip did involve a fair amount of eating and drinking it has to be said. There is downside to this coastal location though. Giant seagulls rain their guano (the excrement of seabirds) down on everything and everyone. It can corrode your paintwork and ruin your outfit and the bold birds can also deprive you off your Gregg’s cheese savoury sandwich if you do not consume it fast enough at lunchtime. 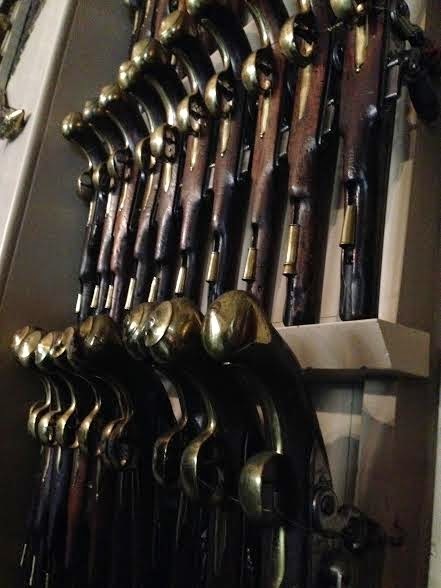 We visited Culzean Castle (pronounced Colleen Castle apparently) with its dramatic cliff top location and saw the largest collection of working flintlock pistols in the world. The armoury was definitely impressive as was the rest of this stately home which is a top attraction in Western Scotland. Overlooking the Firth of Clyde, the castle is the former home of the Marquess of Ailsa, the chief of Clan Kennedy but is now owned by the National Trust for Scotland. There are some small cannons on the ramparts decorated with sea creatures and Ailsa used to have one of these cannons fired into the sea every morning at eight o’clock sharp. The cannon balls were never recovered unless the tide washed them which leads me to deduce there may still be a lot of balls out there to find. What did she do if she wanted a lie-in I wondered? 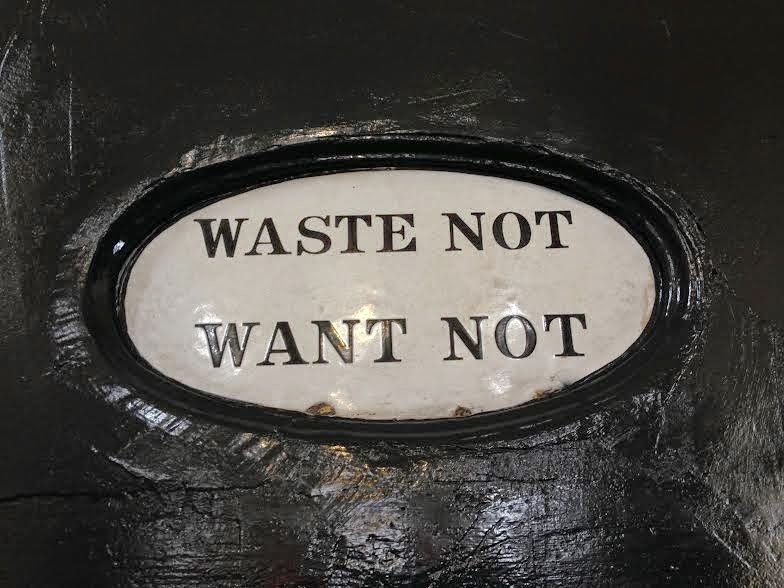 The kitchen range of the great house carries a sign with a very Scottish sentiment ‘Waste not Want not’ and we certainly wasted no time in moving on to the birthplace of Scottish hero Robbie Burns. And don’t get a credit card.. The birthplace of Robert Burns lets you visit the cottage where Robbie Burns grew up and it’s a lovely interpretation of the very rural life he led for the most part with film and sounds and relics representing that much simpler life of days gone by. 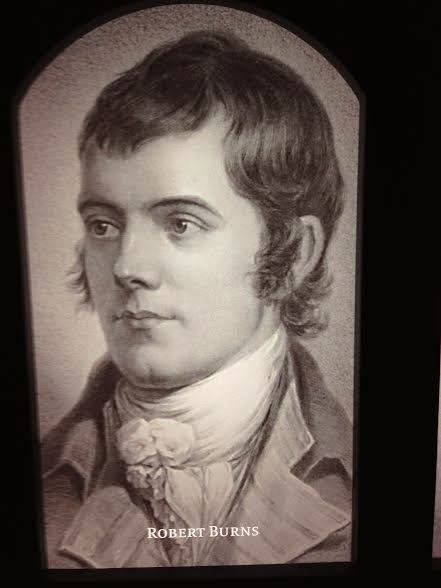 The museum of Robbie Burns is equally well done. 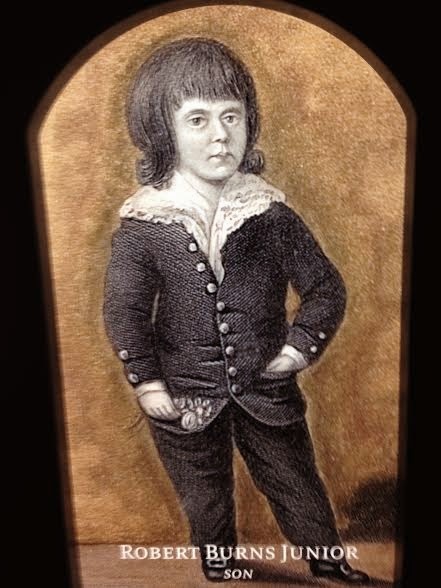 It houses the largest collection of Robbie Burns artifacts and is thoughtful, interactive and fun. You can upload your version of Auld Lang Syne onto the website or make a selection on the Robbie Burns jukebox. He had thirteen children by five different women and as poets are the world over, was a lover – not a fighter. 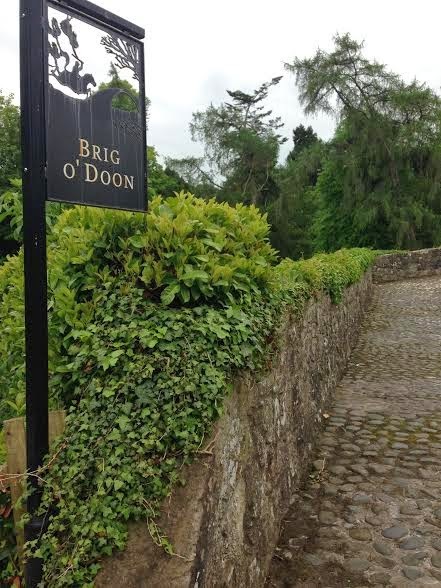 Next we called in at Brig O’ Doon another famous location in Tam O’ Shanter where he gallops over this very bridge to escape a witch. The bridge also inspired the 1947 musical Brigadoon by Lerner and Loewe starring Gene Kelly, which tells the story of a mysterious Scottish village which appears only one day in a hundred years. In a spooky coincidence as we drove away from Brig O’ Doon that song ‘The Whole of the Moon’ by the Waterboys came on the radio which features one of my all time favourite song lyrics ‘I saw a rain dirty valley – you saw Brigadoon!’ Wow, that really made my day. One other stop of note we had was on the famous ‘Electric Brae.’ This is a section of bend on the 719 coast road which causes an optical illusion for drivers and confused passengers. If you stop your car and turn off the engine (put your hazards on) you will feel as if your car is rolling uphill and other people watching your car will see the same thing. In actual fact you are rolling down a slight hill. I didn’t really understand it I confess and despit having a few goes – we weren’t sure whether we’d been optically illuded or not..
There’s lots to see and do around Ayr, and the countryside at this time of year is absolutely stunning. It looks like some kind of giant emerald Brigadoon, winding its way along the coastline. The Isle of Aran would have been visible off the coast if it hadn’t been so misty, and I’m sure there’s still lots more left to explore when next I coast to coast myself. Time was short and we never even got started on the whisky tasting, probably just as well.. 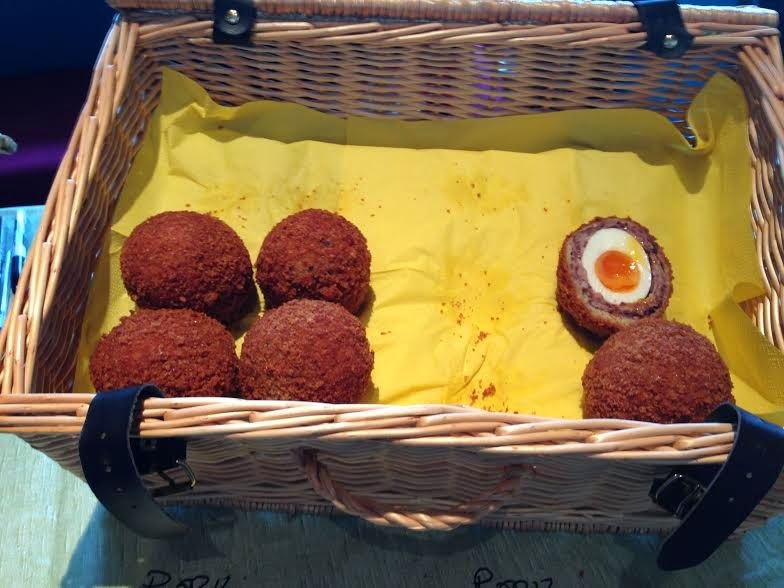 Previous Post:T Rex – definitely not extinct!